You can import contacts from a different email provider or account to your Outlook.com account. When you export your contacts, they will typically be stored in a comma separated values file (CSV). Select CSV UTF-8 as the file type if you have that option. Outlook.com—see Export contacts from Outlook.com to a .csv file. Outlook for Windows—see Export contacts from Outlook. iCloud—see Export your iCloud contacts to a vCard (.vcf) file. Yahoo! Mail—see Yahoo! Mail help. For instructions about how to export your contacts from a service not mentioned here, contact your email provider. Use a comma separated values file (CSV) to import your contacts into your Outlook.com account. Tip: For best results, make sure that the CSV file has UTF-8 encoding. This encoding works for all languages and alphabets. In Outlook.com, select at the lower left corner of the page to go to the People page. On the toolbar, select Manage > Import contacts. Select Browse, choose your CSV file, and then select Open. Note: If the file doesn't have UTF-8 encoding, the import tool may not recognize and display all text correctly. The import tool will then show you some example contacts from your file, and you can check that the text is readable and correct. If the text is not displayed correctly, select Cancel. You will need a file in UTF-8 encoding to continue. Convert your CSV file to use UTF-8 encoding, and restart the import. Why should I care about UTF-8 encoding? Typically, you can import contacts without worrying about the underlying details of how the text is stored in the CSV file. However, if the contact information includes characters not found in the English alphabet, such as Greek, Cyrillic, Arabic, or Japanese characters, this can cause problems when importing contacts. Therefore, you should save the contacts file with UTF-8 encoding if you have that option during export. If you can't export your contacts using UTF-8 directly, you can convert the exported CSV file using Excel or third-party apps. How to do this will be different between apps and app versions. In Excel, create a new blank document (workbook). From the Data menu, select From Text/CSV. Browse to your exported CSV file (you may have to select to display Text Files (....csv) to see it). Select Import. In the dialog box that appears, under File Origin, choose the encoding that makes the characters in the text appear correctly, for example, Cyrillic Windows 1251, and then select Load. Check that characters are displayed correctly in Excel. Select File >Save As. Enter a name for your file, and select CSV UTF-8 (Comma delimited) (*.csv) as your file type. 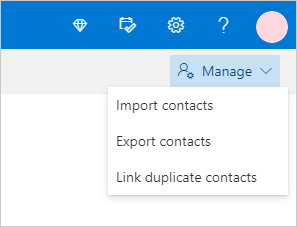 If you're having trouble importing contacts to your Outlook.com account, see Fix problems importing contacts to Outlook.com.